I am more pop culture than high culture and am allergic to pretentiousness, especially if it doesn’t come with some self-awareness and a sense of humor about itself. I also am someone who appreciates directness when an artist is trying to bring something across. None of this vague ‘insert your own meaning here’ for me, unless the aesthetics are so breathtaking that the meaning doesn’t even really matter. These qualities make me a bad fit for poetry and for most of modern art, be it theatre, music, paintings, sculpture or dance. 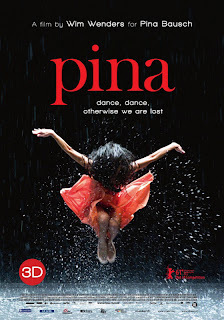 But the trailer for Pina intrigued me: a movie about dance shot in 3D by Wim Wenders, as a tribute to leader of a dance troupe. Pina Bausch was a dancer, choreographer, teacher and the artistic director at the Tanztheater in Wuppertal. She died in 2009. Being a cultural barbarian, I had never heard of her, but that didn’t stop me from going to see her choreography. Pina admittedly isn’t the first movie to realize that dance would benefit from the extra dimension to play around with on screen, allowing a projection to approximate the experience of a live performance, but as far as I know, it is the first one aimed at an art-house audience. It feels more intimate than its grand-scale predecessors and doesn’t really have a ‘story’; it is a collection of ‘best of’ fragments from her choreographies, interspersed with shots of the dancers reminiscing about Pina. The viewpoint of the virtual audience isn’t fixed during the performances, stuck to a seat as they would be in a theater, instead the viewers leap in between the dancers and move around, making for a more dynamic event. To start with the negative, of which I don’t have a lot: there were a few choreographies I didn’t ‘get’. In particular the piece in a large grey room littered with chairs – titled Café Müller – didn’t grab me in either aesthetics or meaning. Unfortunately, this was one of the longer pieces in the movie and considering that the movie overall does end up feeling long, it could have been whittled down a bit to give Pina as a whole more forward momentum. The other on-stage pieces - one with a tribal, earthy flavor taking place on a layer of red sand, one featuring water and a big rock and one which contrasts and plays around with dancers of different genders and ages – hold your attention but feel a little confined in contrast to the pieces that take the dancers outside or at least let the outside world pour in. These pieces are more visually striking and uplifting, most of them shot towards the end of a crisp, sunny day it seems. There is a glass-encased dance studio which shows a bright explosion of leaves just outside and there is a metro on a rail through Wuppertal which is put to great use. Though the movie doesn’t crack a smile for the most part, there is at least one short, very funny sequence in which a woman stomps onto said metro with a pillow. 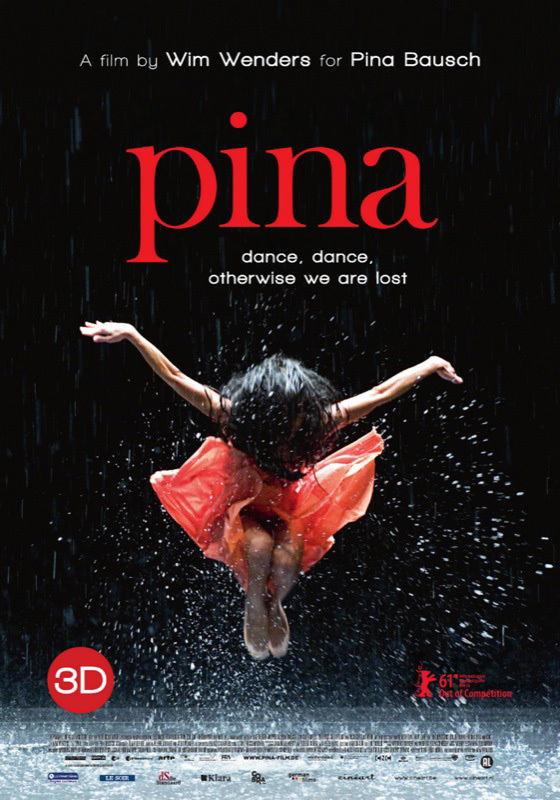 Overall, I am not the intended audience for this movie methinks, but if you have any interest in modern dance whatsoever, Pina deserves a good, long look.